The game can be played completely with the touch screen or by using the basic control buttons, although it seems to be easier if just the buttons are used. Reeling in a fish can not be done with the buttons though. For Movement, just press your stylus on the screen where you want your character to run towards. If you press close to your character then you'll walk. Pressing on the touch screen a distance away will make him run instead. Navigating around the world map is easy, as you just have to tap on the area you wish to enter. If you have an older DS Lite with noticeable diagonal directional-pad problems, the easiest way to make your character face 45º angles is by using the touch screen for movement. Talking with people can be done by walking up next to them and tapping on the character you want to talk to. The chat text will appear on the top screen, but you can press anywhere on the bottom screen to move the conversation along. To activate the pet menu, tap on the spirit pet that is following behind you and then choose the option you want with the stylus. As for fishing, using the touch screen for casting can be a little tricky. To bring out your equipped fishing gear, tap on your character's chest. To put your fishing equipment away you'll have to use the Left Shoulder button (which is the easiest method) or hold the stylus down on your character's head. To cast your line, slide your stylus from your character's chest in the direction you wish to cast in. As the line is releasing you can tap on the touch screen to force the line to cast short, or let it lead to its maximum length. Once the bait has hit the water you can press anywhere on the touch screen to reel in your line. If you want to pull in your line, draw a circle with the stylus around the bait in the water. You could also press the A button to instantly yank in your bait. When you have a hit on your line, tap the touch screen to hook the fish. Your timing will determine if you snag the fish. If you receive a simple HIT then you will earn a normal amount of SP after you successfully reel in the fish. If you receive a BEST HIT then you will earn double the SP, and the SPECIAL HIT will net you triple the SP. You can use the points at Jango's shop to buy new equipment and food. The larger (or rarer) the fish, the more SP you will gain. There is one fish, the Fighting Fish, which will earn you a base of 100 SP even though the fish is less than 3 inches in size. It is available in the Pond and Stream areas to help players earn enough points to purchase adequate equipment early in the game. 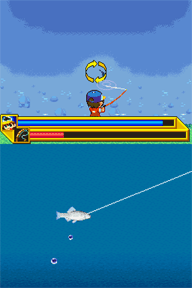 The top screen will display your hit points (blue bar), line tension (red bar), and the fish location from the surface of the water. If your hit points reach 0 you will pass out and wake up inside your house. If the line tension reaches the full length of the bar then the fish will break line and escape. 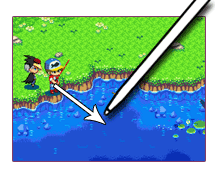 The circular arrows indicate that you currently can reel in the fish. The bottom screen is the underwater scene where your fish is fighting against your hook. To reel in the fish, draw circles in the middle of your touch screen when the fish is facing east. When the fish turns around to swim away, remove your stylus from the touch screen to prevent excessive line tension. You can tap on the screen to force the line to strain and stall the fish's flight, and then start circling again once it has slowed down. If the fish becomes too far off to the side on the top screen, the circling arrows will be replaced with red arrows (>>>>>). You need to pull the fish closer to the center of the top screen before you can reel it in again, so press your stylus on the edge of the touch screen on the opposite side of where the arrows are on the top screen. If the fish is too far over to the right, press your stylus on the left edge of your touch screen. When the fish is dragged back into range the circling arrows will reappear again. Keep an eye on the line tension when you are leading a fish back to center, as it tends to increase very quickly. Pull your stylus off the touch screen if the tension becomes too much, and wait for the bar to decrease before trying again. After you have repeated the reel-relax cycle enough times to bring the fish in, you will be told which fish you have caught, its size, and SP earned. You can then choose to release the fish back into the water, feed the fish to your pet, or store it in your basket.